It’s amazing what a difference extra space can make. 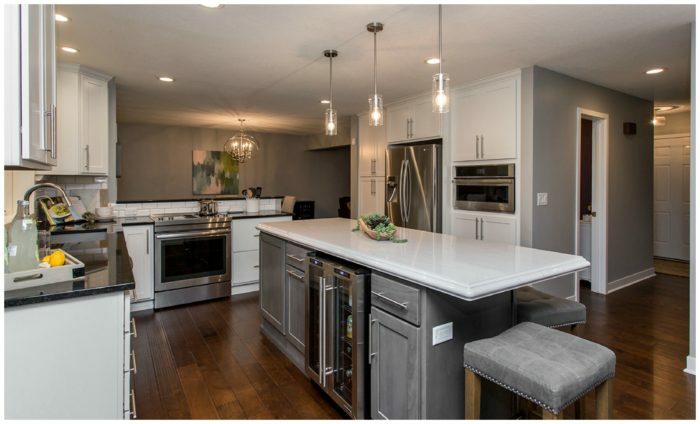 Add in updated finishes in lighter colors and greatly improved lighting, and this kitchen is nearly unrecognizable. 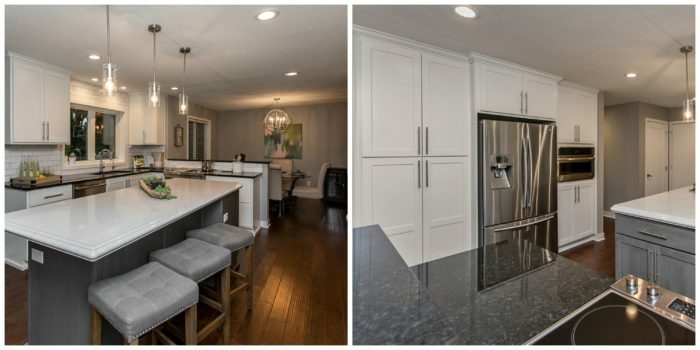 Enjoy the transformation that happened when a cramped and dated kitchen and dining room were combined to create an open and brighter kitchen. The design included careful collaboration with the homeowners to ensure the space is as functional as it is beautiful. BEFORE – A number of dated elements contributed to this kitchen feeling small and dark. Bulkheads lowered the ceiling above the cabinets, the fixtures didn’t provide adequate lighting, and the kitchen and dining rooms – where the family eats most nights – were completely separate rooms. 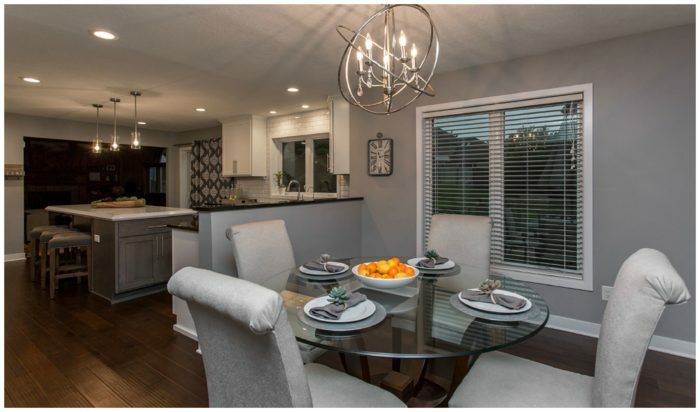 AFTER – The dining room and kitchen were completely remodeled into an open space that’s light, bright and feels much more spacious. A large island replaced the small island and kitchen table that used to be in the kitchen, which created better flow. AFTER – The new kitchen includes much more functional storage. With the bulkheads removed, cabinetry runs all the way to the ceiling, and the desk area was replaced with pantry cabinets that include pullout shelves for easy access to stored items. AFTER – The neutral palette in the kitchen is the perfect background for pops of color and is anything but boring with plenty of texture and detail. 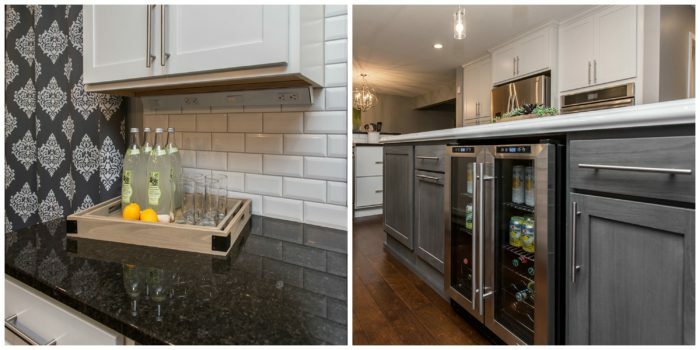 The subway tiles have beveled edges giving dimension to the backsplash. 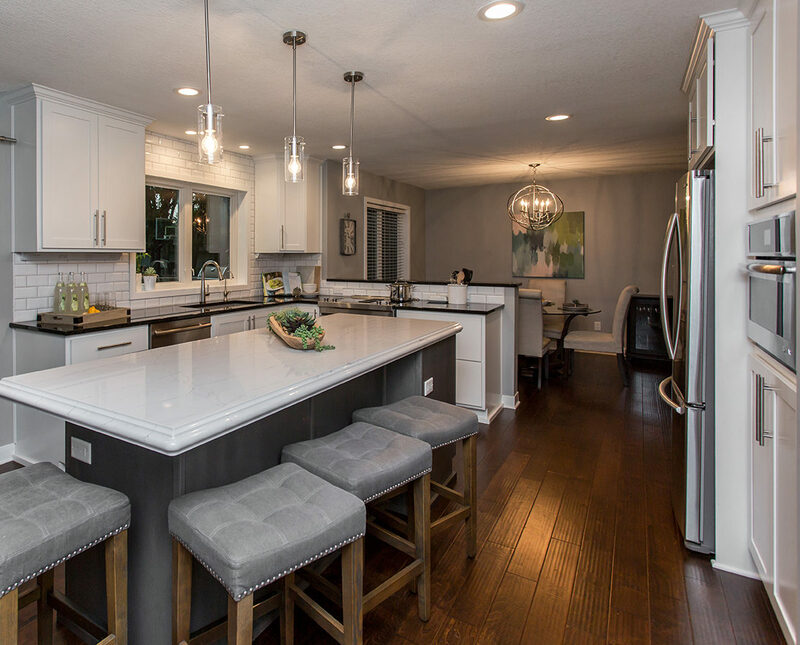 With seating for four and plenty of prep space, the island was already fairly functional, but the addition of an ample beverage fridge and a combination of cabinets and drawers makes this island extra useful. AFTER – A large island is the perfect way to display a great countertop. 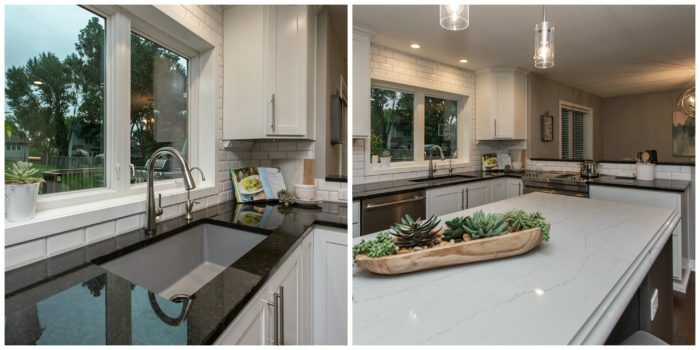 In this kitchen, the white maple perimeter cabinets are topped with glossy Black Pearl granite, while the gray poplar island showcases an gorgeous slab of Cambria Ella quartz with a small ogee edge. AFTER – No longer a small, enclosed room, the dining area flows right into the kitchen. Wide plank birch flooring anchors the space and flows beautifully throughout the first floor. Do you have areas of your home that could benefit from being bigger, better and brighter? We’d appreciate the opportunity to explore options with you that will help you Love Your Home! Attend one of our upcoming remodeling seminars or contact us for a free consultation.